The wrapper is medium brown with a slight red hue to it and some darker freckles. There are a few raised veins present and the seams are easily visible as they are slightly raised. The head is finished off with a well applied triple cap. 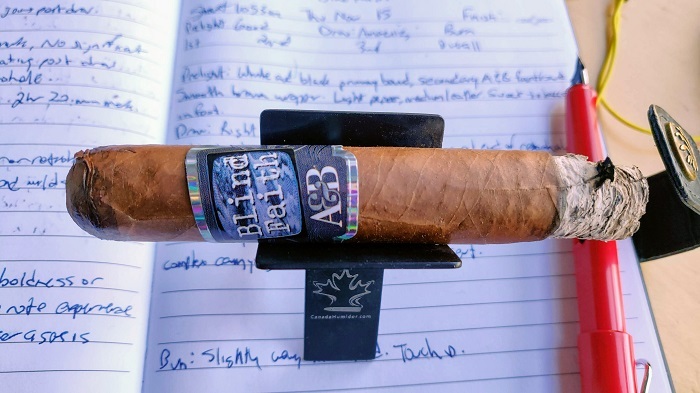 There are two bands with the primary being black with a holographic border along with the line name and the initials of Alec and Bradley. The foot band is white with thin baby blue borders and the names fully spelled out in black. The aroma from the wrapper is barnyard with a prominent hay note while the foot brings wood, leather and a light white pepper. The pre-light draw is a very light mix of wood and hay. 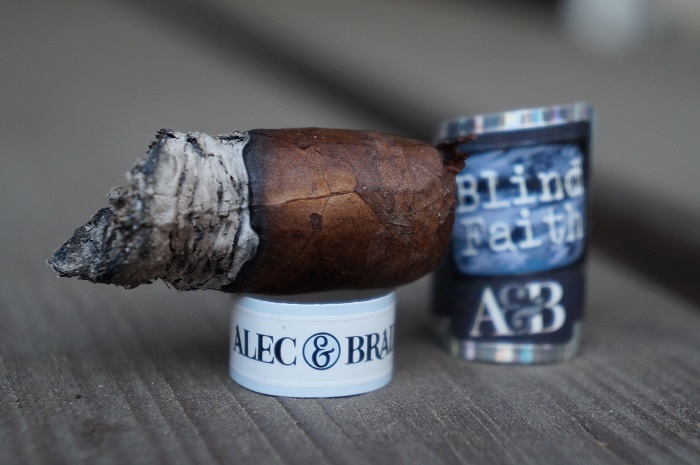 The Blind Faith by Alec & Bradley Robusto has a white and black primary band, with a secondary foot band in white indicating ‘Alec & Bradley’. The wrapper is brown and silky smooth. 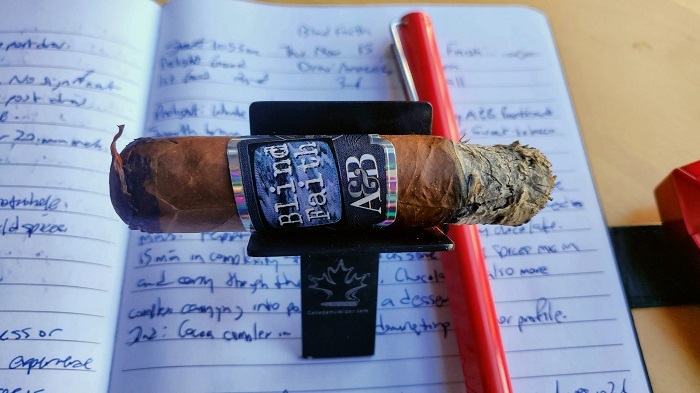 The aroma from the wrapper is light pepper, medium strength leather, with sweet tobacco in the foot. 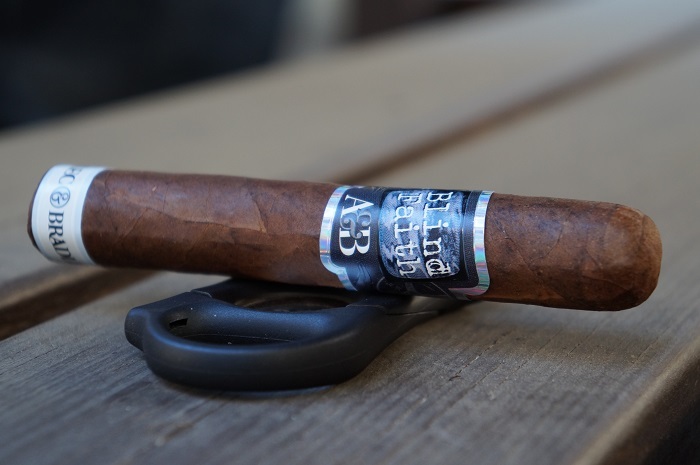 The Blind Faith by Alec & Bradley Robusto has a Colorado Claro light espresso bean brown wrapper. Construction looks and feels good as veins are well pressed, seams tight, bunch and roll even and a well applied thick cap. Aromas from the wrapper tell cedar, wet earth and barnyard. Aromas from the foot give roasted nuts, white pepper and cedar. Cold draw gives lightly salted peanuts, cedar shavings and a subtle white pepper spice. 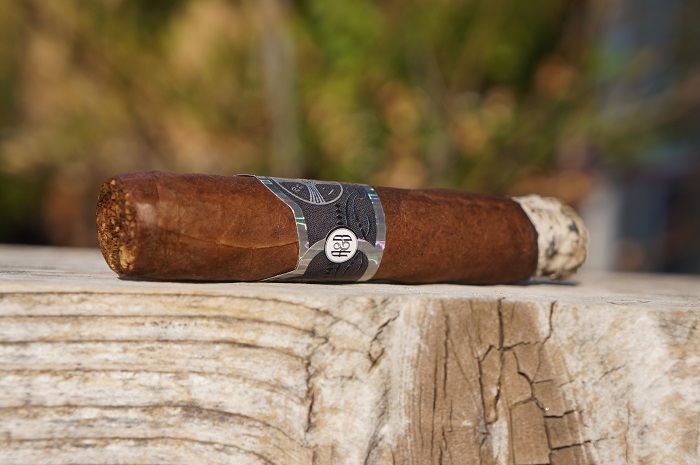 The cigar begins with wood and a highly concentrated cinnamon note. At a half inch in, a slight sweet cream joins in which mellows out the cinnamon while the wood is up front. At an inch in, the wood and sweet cream are up front while the cinnamon has receded pretty far into the background. As the third comes to a close, the wood becomes more defined as oak while the sweet cream remains paired up with it and the cinnamon is a bit dull and still in the background with a very long finish. The strength in this third was right at medium. The first third begins with mild sweetness and pepper. Some mild cocoa is detectable at the end of each retrohale. As the first third progresses, the pepper begins to carry into the post draw and begins to move up to medium minus strength. As the first third settles in, the pepper falls back to a light level and is replaced with a creamy chocolate. 15 minutes in, complexity continues to build with baking spices mixing in and also starting to carry into the post draw, eventually bringing the chocolate with it. The overall experience in the first third is very much like a dessert. From first draw, the main thing I notice is that Blind Faith has more of an aggressive delivery. There is a fresh cut black pepper spice that is front and center. Surrounding the spice gives softer notes to help round out the spice such as roasted chestnuts, espresso beans and lightly charred wood. Retrohaling brings the spice and chestnuts even more forward. The finish has the black pepper hitting the mid and rear palate along with a subtle nuttiness and slight wood char. Strength is nearing medium-full and body is medium. 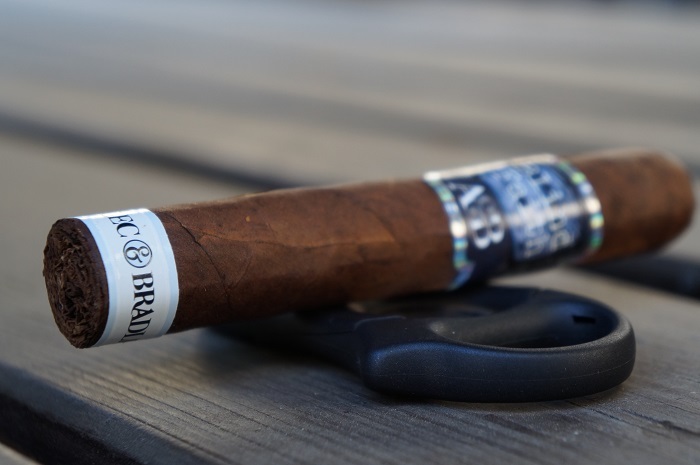 As the second third begins, the oak and sweet cream remain up front while the cinnamon in the background transitions to more of a general baking spice. At a half inch in, the cream drops the sweetness but is still paired up with the oak. The retrohale is cream forward, slightly ahead of the oak. At an inch in, the cream has moved in from the oak a bit while the baking spice still provides a supporting note. As the third comes to a close, the oak gains a toasted note as it is still paired up with the cream. The baking spice has dropped out of the background. The strength in this third bumped up to slightly above medium. The chocolate flavor continues to dominate the profile moving into the middle third. Baking spices begin to gain some strength ground, eventually coming close to matching the chocolate as the middle third establishes itself. Mild sweet cedar joins the profile through the bottom half of the middle third. There’s a major change within the second third. The charred notes all of a sudden dissipate. This allows the profile to be more creamier (with the chestnuts) and the wood character is more cedar-like. Strength moves to a consistent medium-full and body stays medium. As the final third begins, the toasted oak takes a slight lead over the cream. At a quarter inch in, some mustiness joins the profile. 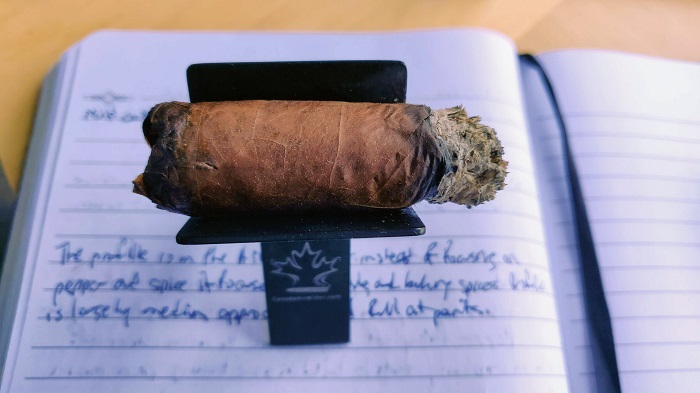 At a half inch in, the cigar begins to heat up which enhances the toast note on the oak. The retrohale presents the toasted oak and light cream. 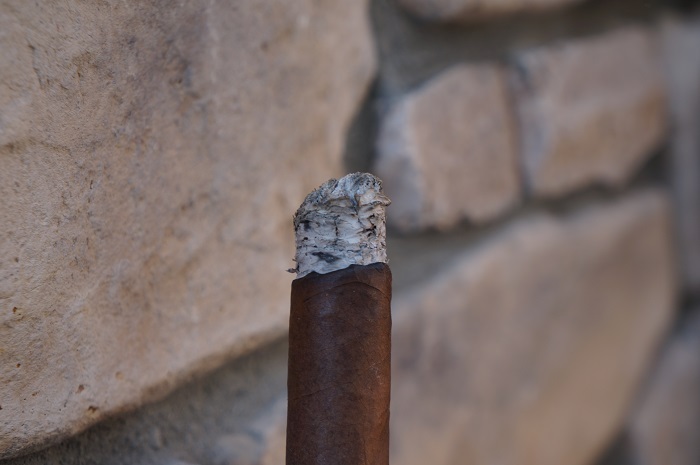 The cigar finishes out with the profile of toasted wood up front with the cream and mustiness slightly behind. The strength remained at slightly above medium. I would define the flavor profile here as sweet cedar, with a trailing chocolate note through the final third. Some mild earthiness joins the post draw once the last third has established itself. 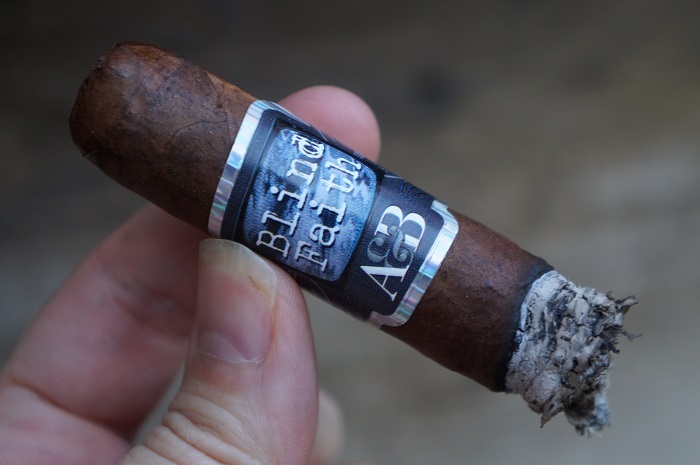 The last third is essentially a continuation of the second third except that there is now a nice under-ripe stone fruit quality. Other than that, the profile still gives fresh ground black pepper spice, creamy roasted chestnuts, espresso beans and cedar. Strength and body finishes medium-full and medium, respectively. The burn line was slightly wavy but always maintained itself. The ash held on in just over one inch increments. The burn is slightly wavy through the first third, eventually requiring a touch-up. The slightly wavy burn continues in the middle third, with no issues in the last third. 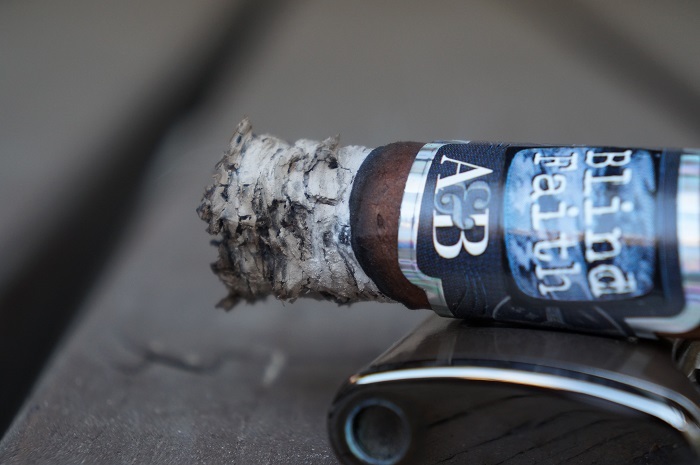 The ash holds on up to 2 inch increments in the middle third. Perfect burn performance. 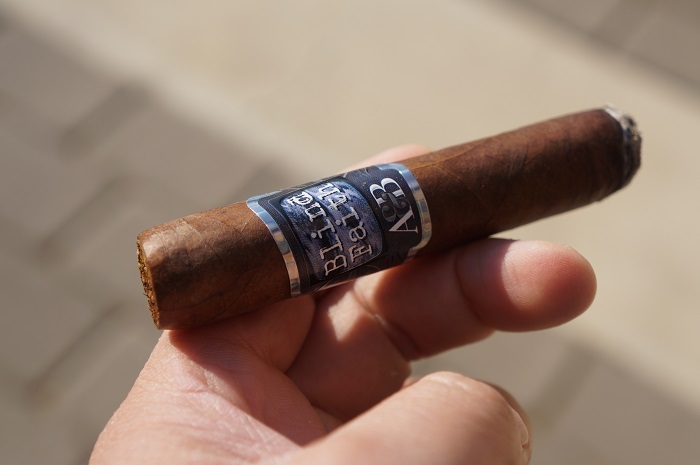 Even burn, solid ashes, ample smoke production, cool burn. 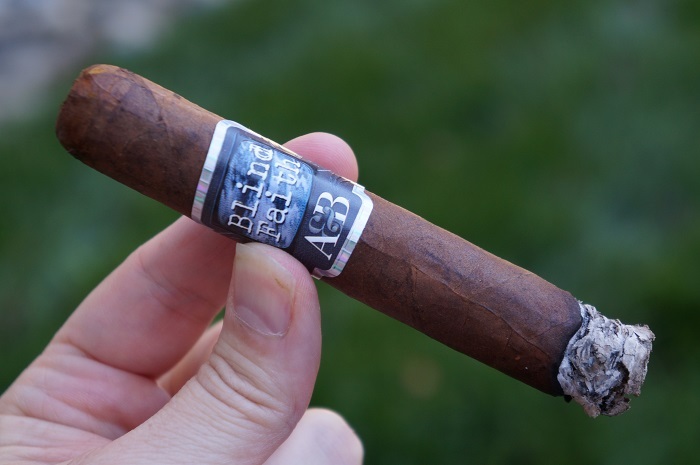 This is a good first offering from Alec and Bradley. The flavor profile consisted of wood, later becoming more defined as oak along with cinnamon transitioning to baking spice with sweet cream. Construction was very good and allowed me to just focus on the flavors. Strength hovered right around medium the whole way. 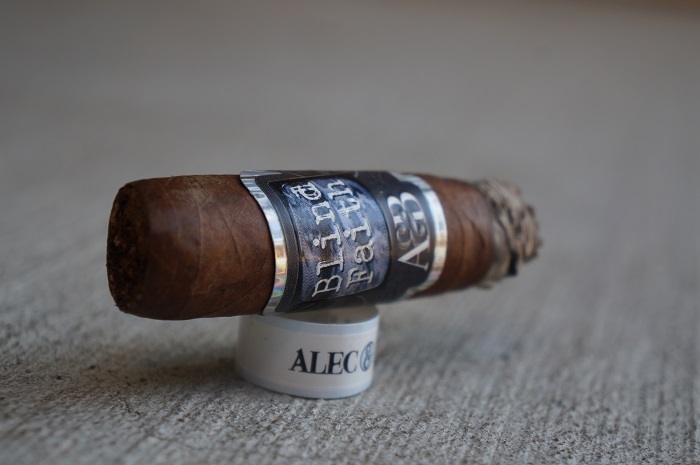 If you’re a fan of Alec Bradley cigars, you’re going to find some similar components here, so it’s a no brainer to give this a try. I’d be up for smoking more of these and look forward to smoking future offerings from the duo. No issues at all with the draw, as the resistance is right in the ideal zone. Perfect draw. Best balance between air flow and resistance. 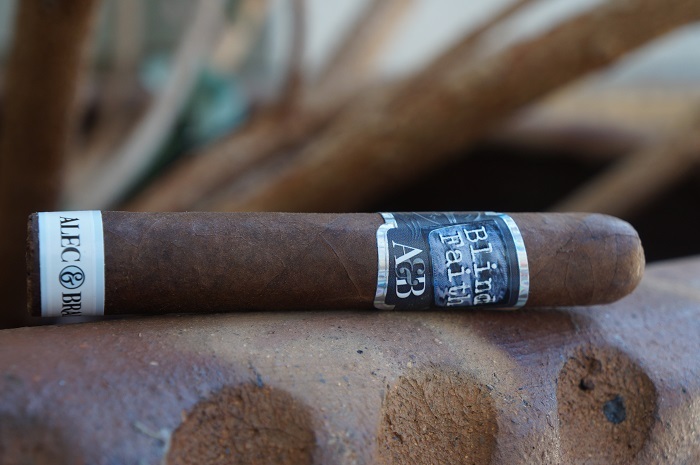 Alec and Bradley’s first introduction of a cigar into the industry is deemed an overall good one that is worth checking out. 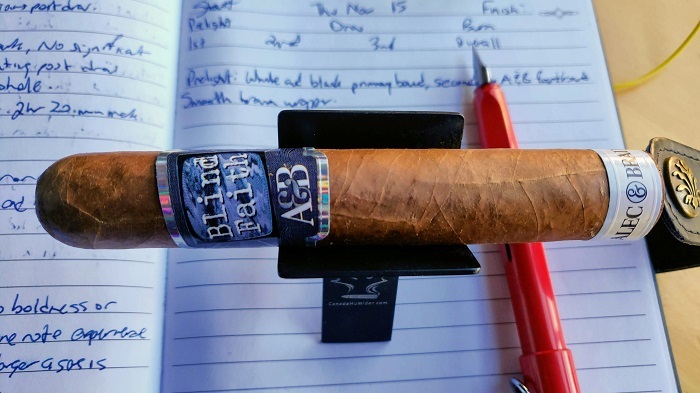 It’s important to note this is a stronger cigar with bolder flavors and strength profile (so eat a meal before hand). 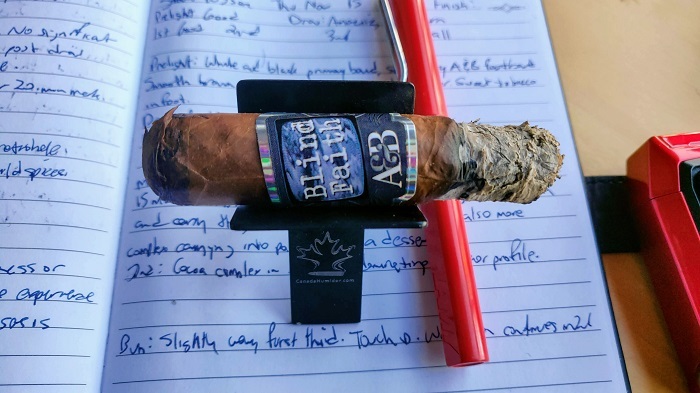 The first third was average being too spice and char focused but the remainder of the cigar turned to a more harmonious delivery of flavors. Take the leap of faith and try it out for yourself.